Many people choose to live in an adult only community when they’re 55 or older because they wish to enjoy peace and quiet and the company of their peers. 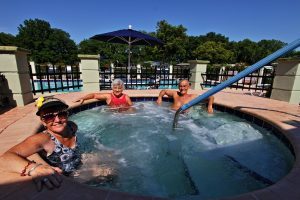 Hyde Park is a gated retirement community that offers all of those perks, plus an affordable active lifestyle that’s enhanced by an enviable location in the heart of Central Florida. Our community provides safe, comfortable manufactured homes in a landscaped neighborhood setting on the outskirts of Orlando for individuals who are 55 and older. No one younger than 18 is permitted to live in the community permanently. We provide a community clubhouse, pool, fitness center, and other amenities that are intended to promote physical activity and healthy social interaction among our residents. For a low monthly home site lease payment, residents enjoy daily access to those amenities, plus professional on-site management and regular lawn mowing services. Moreover, some of the most beautiful beaches in Central Florida are about an hour’s drive from Hyde Park. To learn more about our ideally located adult only community, contact us today. We’ll be happy to schedule a tour for you at your convenience.